Just a few affordable finds for you today- some for you and some for your home. I know I'm getting ahead of myself on the warmer weather theme but since it has been freeeeezing here and our heat hasn't been working for the last few days ( can you imagine?! It's Murphy's Law that this should happen during the coldest days of the year) I have been thinking about warmer weather and I found these great little things I thought you might like. Banana Leaf Prints || You all know about my fascination with The Aestate's work from all the times I have blogged about it so its no wonder I have fallen in love with her latest prints which are a series of four inspired by the iconic Beverly Hills Hotel wallpaper. How fabulous would they all look hung together? They come in a large format (20x30) which just adds to their tropical drama. Tin Plates || Can we all please just admire these tin plate beauties with the fabulous antique patterns? They are just $10 each. I just want to get on my bike with a picnic basket filled with these plates, a bottle of champagne and a french baguette (oooh and maybe some brie and prosciutto too!). They would make an excellent hostess gift as a set as well. Embroidered Clutch || Cute and colorful- it goes with everything. It would be perfect for those weekend beach getaways where you pack light. You can get away with just this clutch to go with ALL your beachy dresses. Straw hat || This hat is elegant and gives you full coverage with its wide brim- what could be better? Very Missoni no? and its only $5 bucks! Nowadays there isn't much you can get for this amount of money. Stay warm friends. I can't wait until I don't need to wear my coat inside my house. I agree those tin plates are fantastic! I have always loved the top right one! I need those plates! I find dreaming about warmer weather makes the winter less harsh....that and a tropical cocktail. No heat?!?! Oh no! Stay warm!!!! Love these fun colors! Makes me think of summertime in Palm Springs! Love your warm inspiration!! Those plates are fabulous! That clutch just feels like a vacation–so cute! I saw those plates the other day and had my weekly "I wish I lived close to Furbish" moment. Love that clutch! A little wishful thinking never hurt! I am loving the tropical leaf prints too - birthday wish list! I'm ordering one of those prints from The Aestate today! Love palm leaves! that clutch is amaaaaazing! and can't wait for warmer weather ahhh. Looooove the palm prints from Jessica. I want to do a whole room around them one day! Oh I'm with ya honey! Winter blues got me thinking about resort season already! This collection is perfect for some fun in the sun! I LOVE banana leaf prints, especially for home stuff. Furbish studio has a lot of cute versions of it right now! I've been smitten with The Aestate's prints for like ever...the banana leaves are amazing!! Loving those tin plates as well! 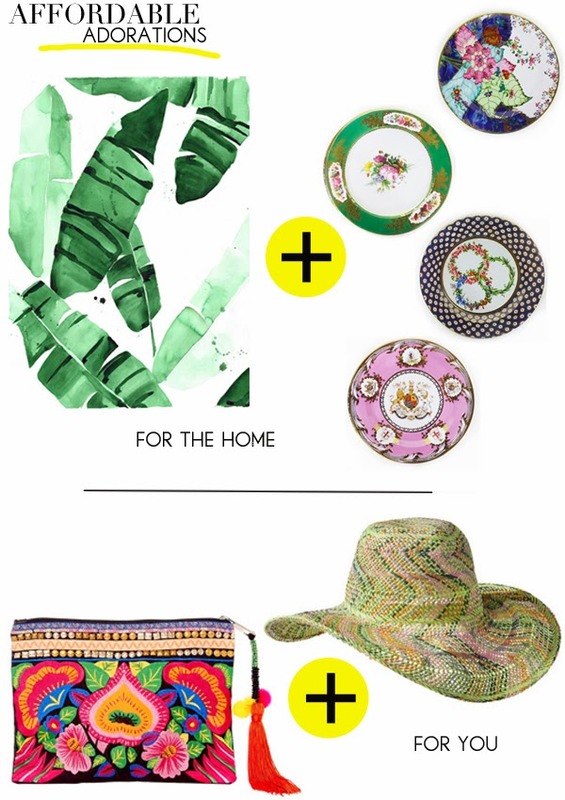 Ooo those banana leaf prints are such a great find! I want them ASAP! Alber! Que bello el post de hoy jueves 9 de enero! El collar me tiene loca pero no está dentro de mi presupuesto... cuéntame de el clutch!!! Me encanta pero el link me manda a la página de Target. De donde es? Un abrazo!